This paper assesses the macroeconomic effects of unconventional monetary policies by estimating a panel VAR with monthly data from eight advanced economies over a sample spanning the period since the onset of the global financial crisis. It finds that an exogenous increase in central bank balance sheets at the zero lower bound leads to a temporary rise in economic activity and consumer prices. The estimated output effects turn out to be qualitatively similar to the ones found in the literature on the effects of conventional monetary policy, while the impact on the price level is weaker and less persistent. Individual country results suggest that there are no major differences in the macroeconomic effects of unconventional monetary policies across countries, despite the heterogeneity of the measures that were taken. Translation: The Fed may not necessarily be out of bullets. It just has to do something "unconventional" to expand its balance sheet. The effects were the same "despite the heterogeneity of the measures that were taken." I have no idea what Ben Bernanke will say at Jackson Hole, but I would be shocked if he announced QE3 this year. Nevertheless, I would expect that central bank action will act to send global equity prices on a tear some time in September because of the actions of the ECB, not the Fed. The ECB seems to be repeating the mantra "staying within our mandate". In addition to the ECB's mandate of price stability, i.e. fighting inflation, Draghi emphasized the point that "it is committed to its responsibilities as an institution of the European Union" and the existential imperative to support the euro. We act within our mandate, which is primarily geared toward guaranteeing price stability over the medium term in the euro area as a whole. Only a currency whose continued existence is not in doubt can be stable. That’s what we in the ECB are working for. The ECB will only act in parallel with the EFSF and the ESM later. For this purpose, a State must submit an alternative claim and extensive economic support fulfillment. In my opinion, the EFSF and the ESM at the request of the country concerned to intervene in the primary market before the ECB intervenes. Such a request is only the necessary condition for action by the ECB. The Governing Council will continue shall act independently of whether, when and how the ECB's bond purchases on the secondary market. With this method, to ensure that the affected country also implements all necessary and agreed reform measures. The error with Italy in the summer of last year, as the ECB has bought Italian government bonds and the time was unfortunately not used for necessary adaptation measures may not be repeated. In addition, the new program will be set up so that the problem of the perception of a preferred creditor status of the ECB will be addressed. Because this perception complicates the countries concerned to return to the capital market, because their status as private investors feel insecure and turn away from the country concerned. Finally, the ECB will buy under the new program, only bonds with short maturities. The control of short-term Geldmärkt is the classic job of monetary policy. In addition, the distortions in the short end of the yield curve in times of crisis are particularly strong. The technical and operational details of the program are currently being developed. The Governing Council will deal extensively with all these aspects of the program at its meeting in a few days. The whole discussion is led by the proviso that any concerns of a non-conforming state funding withdrawn. We will act only within our mandate. In other words, the Establishment has gotten together and brushed aside the objections of the Bundesbank and will implement a bond buying program for peripheral countries, but under certain conditions: in parallel with EFSF and ESM and only if the member state asks; subordinate its "preferred creditor status" and only in the short maturities. Asked about comments by a party leader calling for Greece to leave the 17-nation currency, Merkel told ARD television that such comments were damaging as crisis fighting reaches a “decisive phase.” Alexander Dobrindt, general secretary of the governing Bavarian Christian Social Union, told Bild newspaper that Greece wouldn’t be part of the euro in 2013. “Everybody should weigh their words very carefully,” Merkel told ARD yesterday in Berlin. The Greek government under Prime Minister Antonis Samaras is undertaking “serious efforts” to reduce its debt, she said, and reiterated Germany’s desire to stand by the country where the crisis originated. After reading the above analysis, you may be tempted to conclude that the ECB will formally announce the details of its bond buying program at its meeting on September 6. Investors betting on that outcome will likely be disappointed. Don't forget that the ECB is a bureaucracy. Bureaucracies do everything in careful steps. Recall that Asmussen said that the program will be undertaken in conjunction with EFSF and ESM, but the German Constitutional Court ruling on ESM won't come down until September 12, six days after the September 6 ECB meeting. Don't expect a formal announcement from the ECB on September 6. We need all the pieces to fall into place after the German Constitutional Court ruling, which most analysts expect to be favorable. When it comes to the crunch, the wealth white people have indeed come through and they are kicking the can down the road yet once again. Also don't forget the Fed, even though Bernanke may not announce QE3 at Jackson Hole, he has made it clear that he stands ready to act should the economy weaken. The Bernanke Put still lives. I read with some interest the report by Jonathan Tepper of Variant Perception, highlighted by John Mauldin and Isabella Kaminska at FT Alphaville, about the likely long term path for Australia. The report is entitled Australia: The Unlucky Country. In a nutshell, Tepper believes that Australia's problems has two components. The first component consists of too much financial leverage and an over-reliance on external financing, i.e. the kindness of others, which makes its economy an accident waiting to happen. The second component, or the likely trigger of the pending accident, are "a domestic housing market that is one of the most overvalued in the world and a reliance on the Chinese fixed asset investment craze". Should China's growth, in particular its infrastructure growth, slow significantly, then the effects on the Australian economy could be ugly. Australia net external debt levels resemble those seen in the European periphery; the currency is fundamentally vulnerable. 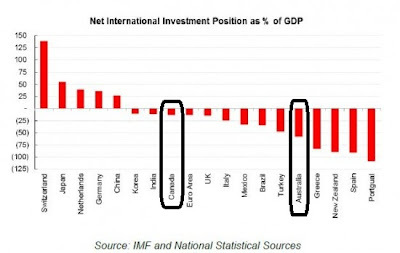 Australia has been running a persistent current account deficit since 1980 and the country's negative net international investment position is one of the largest in the world. On this background, the strong currency makes no sense and fundamentally the currency is very vulnerable to capital flight from the banking system. Australian banks and corporates rely heavily on foreign funding; the RBA will have to provide liquidity through LTROs. Structural global deleveraging and stop-go flows add volatility for Australian banks. As the housing market continues to correct, it may be difficult for Australian banks to fund themselves. Lowering interest rates will hurt the margins of the banks, and the RBA will likely be forced into domestic liquidity operations to prop up its banks. Australia's commodity sector is tied to a structurally slowing Chinese economy. The commodity sector remains a force to be reckoned with in Australia and will remain cyclically tied to China. Still, the Chinese economy is structurally slowing down and this will impact the growth rate of mining and resource related activities in China. Australia is likely sitting on significant overcapacity in the mining sector which will be difficult to transfer to other sectors. China’s Premier Wen Jiabao urged extra measures to support exports and help meet economic targets as a decline in industrial companies’ profits added to evidence that the nation’s slowdown is deepening. “The third quarter is a crucial period for realizing full-year targets on export growth,” Wen said during an inspection tour of Guangdong, the nation’s biggest exporting province, the official Xinhua News Agency said Aug. 25. Industrial profits fell 5.4 percent in July from a year earlier, the statistics bureau said today. 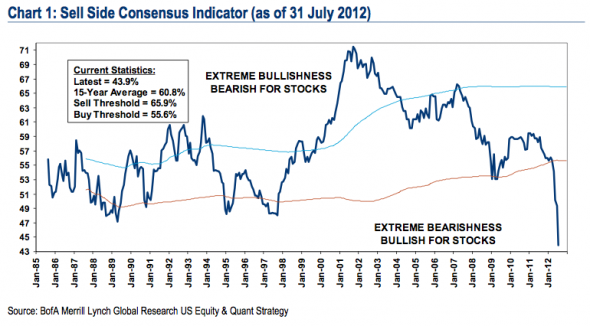 The chart below from Goldman Sachs illustrates the point perfectly. It shows that for A-share companies (CSI 300) which have reported their second quarter earnings, earnings growth on a year-on-year basis for second quarter of 2012 is now hugely negative if we exclude the financials. Meanwhile, profits for MSCI China in the first half increased by a mere 1% yoy, or –5% yoy when financials are excluded. If investors are so worried about Australia, but want to have exposure to the global sectors that it represents, there is a better way - Canada. The equity markets of both countries are structurally similar, with similar degrees of weighting in resources (though Canada is more energy heavy and Australia is more tilted towards mining). The chart below of the relative performance of the US-listed Australian (EWA) and Canadian (EWC) equity market ETFs show that EWA at the top of the trading range against EWC. Moreover, we have see a recent turnaround in the relationship in favor of Canadian equities. Australia sounds like it may be an accident waiting to happen. As for the timing of a downturn, I have no idea when China's economy will hit a serious air pocket, but when it does the Australian economy is going to be toast. For investors looking to get exposure to those global sectors represented by the Australian stock market, Canada is a better bet given the their recent relative performance and risk profiles. In short, it's may be time to buy Canada and sell Australia and, for the adventurous, buy Canada and short Australia. Why do we—bankers in particular—continue to put so much faith in financial models, when time and again they have failed, in some cases with catastrophic effects on the economy? Author and former quantitative analyst Emanuel Derman will discuss why it is a terrible mistake to trust models. Though financial models imitate the style of physics and employ the language of mathematics, they ultimately deal with human beings. This is problematic because models in physics aim for a description of reality while economists’ equations are limited in that area. The author will also discuss what a model is, and then highlight the differences between the successes of modeling in physics and its failures in economics. He will also cover the collapse of the subprime mortgage CDO market in 2007, urge us to stop a naïve reliance on these models, and offer suggestions for mending them. Last Monday, I wrote that I was getting bullish but equities looked a tad overbought and I was waiting for a corrective pullback (see Getting bullish, but wait for the pullback). As the markets appear to have begun to pull back last week, my intermediate term view remains bullish as signs of a global cyclical turnaround are everywhere. Consider, for example, the chart below of the relative performance of the Morgan Stanley Cyclical Index against the market (in black) and the relative performance of the defensively oriented Utilities sector (in purple). Note how cyclical stocks have been turned up in early August and they broke out of a relative downtrend that stretches back to February. By contrast, the defensively oriented Utilities sector has rolled over significantly in the last few weeks. Besides the Cyclical vs. Utilities turnaround, I see other signs of an upturn in risk appetite. The silver/gold ratio has started to turn up. Silver is often considered to be the poor man's gold and has tended to be more volatile and has acted as a good indicator of risk appetite. The chart below shows the silver/gold ratio in the top panel and the gold price in the bottom panel. The silver-gold broke out of a downtrend that stretches back over a year. The bottom panel shows that the last time this breakout happened, which was in September 2011, gold rallied from roughly the 1280 level and ultimately topped out at over 1800, though the silver-gold ratio flashed a sell signal at about 1570. I attribute these turnarounds in risk appetite and the cyclical outlook to stabilization in Europe. Draghi's comments appears to have taken the risk of a Lehman-style meltdown off the table (yet once more) and European equities are turning up as a result. The FTSE 100 recently experienced a golden cross, indicating an uptrend has begun. Across the English Channel, the Euro STOXX 50 looks like it is about to see a golden cross soon, which is another sign of recovery. To be sure, there are risks that the current pullback could be something more serious than just a correction and develop into a serious pullback. In the short-term, I am watching closely how the market reacts to news for signs of how investor psychology is shifting (or not shifting). A number of them indicated that additional accommodation could help foster a more rapid improvement in labor market conditions in an environment in which price pressures were likely to be subdued. Many members judged that additional monetary accommodation would likely be warranted fairly soon unless incoming information pointed to a substantial and sustainable strengthening in the pace of the economic recovery. Recall that as we headed into this meeting, the data had turned particularly weak. The pace of job growth had fallen dramatically from the start of the year, retail sales were flattening out, and GDP growth had slowed to 1.5%. This data combined with the downside risks from Europe raised genuine concerns that more easing was necessary. But they held back, instead waiting to see how the data evolved. Since then, the data have turned upward, much more consistent with the Fed's medium-term forecast. The July employment report was stronger, retail sales picked up, and overall growth is looking stronger, with Goldman Sachs' GDP tracking estimate rising to 2.3% for the third quarter. In addition, equity markets are on firmer ground as the crisis in Europe has at least temporarily receded. While certainly not exciting, the better tone of the data is palpable. I think the better data influenced Atlanta Federal Reserve President Dennis Lockhart to shift his language away from his dovish July comments. In short, I would argue that the data since the last FOMC meeting has in fact pointed toward an improvement in the pace of the recovery, which I think will pull the middle ground back from the brink of additional asset purchases. I tend to think that the middle ground will be pulled by recent data in the direction of Bullard, which is why I see QE3 as less of a slam-dunk than the minutes seemed to imply. Evans pushed his usual agenda; I would expect nothing less from him. He wanted more action before this summer's signs of slowing. No reason to expect the most recent data would change his view. Supposing that Bernanke is silent on QE at his Jackson Hole speech, or is relatively ambiguous (e.g. we have the tools and we stand prepared to act), how will the market react? I also wrote that I was expecting a disappointing August NFP release on September 6, given the deterioration of conditions from the Gallup survey. Should they come in at below expectations, will the market see it negatively, as a sign that the economy is weakening, or positively, as further impetus for the Fed to engage in QE3? The realities of Draghi's "whatever is takes"
With the court set to rule on Sept. 12, investors looking for Draghi to announce a definitive purchase program at his Sept. 6 press conference might be disappointed, according to the officials, who spoke on condition of anonymity because the deliberations are not public. The program is still being worked on and staff may not be able to finalize it by then, said the officials, who are familiar with thinking on the ECB Governing Council. An ECB spokesman in Frankfurt declined to comment. Draghi might hint at the nature of any programs that could be enacted, but I doubt if we would get much in the way of details or "modalities". While Draghi is likely to give a progress report on the bond plan after the Sept. 6 rate decision, the ultimate design of the ECB’s program may depend on the uncertainty over the permanent bailout fund being resolved, so the officials said it makes sense to wait for the German ESM court ruling. Full details of the ECB’s plan could be a month away, they said. While the Bundesbank opposes ECB bond purchases, it expects to be outvoted, one of the officials said. How would the market react then? Supposing that soon after a market friendly German Constitutional Court decision, the ECB announced a program that gave the market everything it wanted - the unlimited purchase of Italian and Spanish debt in a given maturity range. How will the market react? Will market participants view this as a sign that risk premiums are destined to come down, which would be bullish, or will they see this as an opportunity to put all their Spanish and Italian paper to the ECB, which would be bearish? Will the market think the glass half-full or half-empty? Watch the market reaction to events. For now, my base case scenario is that we are experiencing a healthy correction in the context of an intermediate term uptrend. I generally don't comment on politics because I believe that a good investor should be agnostic about political developments. Nevertheless, as we approach the election in the United States, it can be useful to reflect upon the political choices we all make. As an example, I recently came upon a Huffington Canada poll that illustrates the stark political difference between Americans and Canadians. This rather (unscientific) poll that asked Canadians "What would you do to change Canada?" As expected, the answers were all over the map. What struck me was the tone of the answers was about how to divide the pie and not about how to increase the size of the pie. There was no discussion about fiscal policy (government deficits) or micro-economic policy, such as how to make the economy grow or to stimulate innovation, etc. There was none of the discussion about tax rates that has been a part of the discussion during this election season in the US. In Helsinki, we got into a fascinating conversation within a small group of locals about that tax rate. The national and local income tax, real estate taxes, state sales tax, and then the VAT tax mean that a 70% tax rate (versus gross income) was pretty typical. That seemed astonishingly high to me. But someone pointed out that once you add in the costs of health care, student loans, retirement investments, etc. — all the things state pay for with that 70% rate — an American making less than $100k ended up with about the same 30% net as the Finns do. The difference is we have more stress than they do. Canadians have shown admirable restraint — something normally in short supply here in the U.S. They’ve actually opted to hold down medicare costs by consciously waiting longer and limiting supply, mostly for elective procedures. Imagine that. Canadians, in other words, have made a choice to be fiscally conservative, Carroll says in his well- documented article. They’re more realistic and less demanding than many American patients are. Carroll says that Canadians COULD, if they wanted to, cut down wait times — by spending more on health care. But they’ve actually made a conscious choice not to do this. This is no smoke screen: I’ve heard callers on Canadian radio shows state exactly this many times. They’d rather show personal restraint by waiting a bit longer than running up deficits. The final myth about Canada rationing health care in its system and the U.S. not doing so governmentally, is trickier, Carroll admits. But he points out that although the U.S. pays quite a bit more of its GDP than Canada does on health care, far more Americans in need of care go unseen by doctors. And U.S. medical outcomes, he adds, are middling at best. Having lived in both countries, I think that the difference in attitudes between Americans and the citizens of major western countries is aspirational. Americans still believe in the American Dream. Even if they are poor, they crave policies that favor the well-off, even if it's to their detriment given their current conditions, because they aspire to move up the ladder. Canadians and Europeans, on the other hand, are more resigned (or realistic, depending on how you look at it) about their current conditions and have fewer aspirations to make it to the top. The net result for the average citizen is about the same. It's about the attitudes you adopt. 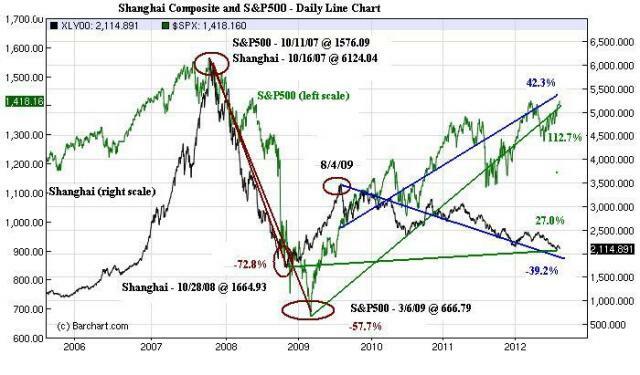 There has been some buzz over a post at Global Macro Monitor about the divergence between the Shanghai Composite and other global equity indices. 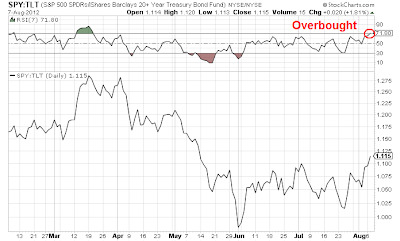 Both Abnormal Returns and Josh Brown have picked up on this and there seems to be some hang wringing over this apparent negative divergence. The answer is simple - China's current policy of growth at any price that results in profitless growth (see my previous post Crouching tiger, hidden profits). I had written before that I was seeing signs of healing in global markets, except for the US (see What to do for the rest of 2012). With the recent strength we had been seeing in stocks, I am now finally seeing signs of a bullish resolution to the risk-on/risk-off trade. Consider the relative performance chart of the Morgan Stanley Cyclical Index, shown in black, and the relative performance of Utilities against the market show below. Recently, cyclical stocks have staged a bullish reversal while the defensively oriented Utilities sector has staged a bearish reversal on a relative basis. Despite the bullish underpinnings for the risk-on trade, I wouldn't get too excited today just yet. Many of my short-term indicators are in deeply overbought territory. While the intermediate term trend may be up, I would be patient and wait for a pullback before committing fresh funds to stocks. The macro environment has been relatively positive for the last couple of weeks, but we remain in a seesaw and volatile environment. With a generally positive backdrop seen in Europe, the market is setting itself up for disappointment and could hit an air pocket at any time. Possible triggers include more talk of Grexit, likely disappointment at the annual Jackson Hole meeting over pre-announcment of more quantitative easing and possible disappointment over the August NFP, as Gallup has shown deterioration in their unemployment surveys. My inner investor is getting ready to average into stocks over the next few weeks. My inner trader wants to wait or even raise a little cash here in preparation to buy when the correction hits in the days ahead. Could China be re-balancing growth to the wrong consumer? [A]t another level, the policy response is only storing up problems for the future. Prior to the current slowdown, the Chinese authorities had committed to restructuring their economy. Restructuring meant redirecting Chinese output from foreign to domestic markets, which implied a change in the product mix, given differences in Chinese and foreign spending patterns. Restructuring meant rebalancing domestic spending from investment to consumption. The investment rate would be lowered from a stratospheric 50 percent, given that no economy can productively invest such a large share of its national income for any length of time. There would be no more construction of ghost towns and no more bullet trains running off the rails, in other words. As wages rose, the share of consumption would be allowed to rise from 1/3 of GDP toward the 2/3 that is the international norm. Bank balance sheets would be strengthened by holding financial institutions to stricter reserve requirements and higher lending standards. The result was to be a better balanced, more stable, and less financially vulnerable Chinese economy. Given the global slowdown and the Chinese policy response, this restructuring agenda is now on hold. The new measures will succeed in keeping high single-digit growth going for a time, as they did in 2009-10. But they will do so by aggravating the economy’s imbalances and storing up problems for the future. This is not good news for those of us concerned with China’s longer run prospects. Interest in shifting manufacturing to the U.S. is particularly strong among companies in several sectors identified in BCG’s March report as nearing a “tipping point.” In these industry groups, China’s cost advantage is likely to shrink within the next few years to the point where companies should rethink where they produce certain goods, mainly those for sale in North America. These tipping-point sectors are transportation goods, appliances and electrical equipment, furniture, plastic and rubber products, machinery, fabricated metal products, and computers and electronics. BCG predicts that production of 10 to 30 percent of U.S. imports from China in these industries, which account for approximately 70 percent of goods that the U.S. imports from that nation, could shift to the U.S. before the end of the decade. Ironically, the latest Chinese move to engage in the more-of-the-same infrastructure based stimulus will have the effect of re-balancing growth away from infrastructure spending to the consumer. But instead of the Chinese consumer, it will be the American consumer as the reverse offshoring trend starts to take hold and accelerate. As for our debt mountain, we have barely begun the great purge. Michala Marcussen from Societe Generale says the healthy level is around 200pc of GDP for advanced economies. If so, we have 100 points to cut. Maybe because Evans-Pritchard is such a euroskeptic that he has become excessively gloomy. I found Ray Dalio's explanation of the debt supercyle using the Monopoly analogy a great framework for analysis - and once you have the framework, you will naturally understand what is happening and be able to forecast the outcomes for yourself instead of waiting for some pundit to tell you what is likely to happen next. [I]f you understand the game of Monopoly®, you can pretty well understand credit and economic cycles. Early in the game of Monopoly®, people have a lot of cash and few hotels, and it pays to convert cash into hotels. Those who have more hotels make more money. Seeing this, people tend to convert as much cash as possible into property in order to profit from making other players give them cash. So as the game progresses, more hotels are acquired, which creates more need for cash (to pay the bills of landing on someone else’s property with lots of hotels on it) at the same time as many folks have run down their cash to buy hotels. When they are caught needing cash, they are forced to sell their hotels at discounted prices. So early in the game, “property is king” and later in the game, “cash is king.” Those who are best at playing the game understand how to hold the right mix of property and cash, as this right mix changes. Now, let’s imagine how this Monopoly® game would work if we changed the role of the bank so that it could make loans and take deposits. Players would then be able to borrow money to buy hotels and, rather than holding their cash idly, they would deposit it at the bank to earn interest, which would provide the bank with more money to lend. Let’s also imagine that players in this game could buy and sell properties from each other giving each other credit (i.e., promises to give money and at a later date). If Monopoly® were played this way, it would provide an almost perfect model for the way our economy operates. There would be more spending on hotels (that would be financed with promises to deliver money at a later date). The amount owed would quickly grow to multiples of the amount of money in existence, hotel prices would be higher, and the cash shortage for the debtors who hold hotels would become greater down the road. So, the cycles would become more pronounced. The bank and those who saved by depositing their money in it would also get into trouble when the inability to come up with needed cash caused withdrawals from the bank at the same time as debtors couldn’t come up with cash to pay the bank. Barron's: What makes all the difference between the ugly and the beautiful? Dalio: The key is to keep nominal interest rates below the nominal growth rate in the economy, without printing so much money that they cause an inflationary spiral. The way to do that is to be printing money at the same time there is austerity and debt restructurings going on. Evans-Pritchard believes that the resolution problem is a binary one - either "inflation (1945-1952) or default (1930-1934)". Dalio is far more nuanced. You just need the right policy mix of austerity, debt write-offs and defaults and money printing. Once you understand the framework, you understand the situation and you can analyze it all by yourself. I've been pondering the apparent divergence between the Shanghai Composite and commodity-based indicators of Chinese growth. The Shanghai Composite remains in a downtrend. Even though it has staged a recent rally, the intermediate term trend is still down. On the other hand, commodity-based measures, which are secondary indicators of Chinese growth, appear to be either stabilizing or undergoing a bullish reversal. For the purposes of this analysis, I will not show commodity indices because they are somewhat distorted by the spectacular rally in grain prices, but consider industrial commodities such as Dr. Copper, which has stopped falling and appears to be undergoing a period of sideways consolidation. Another important indicator of Chinese demand is the AUDCAD exchange rate. Both Australia and Canada are positioned as major commodity exporters, but the Australian economy is more sensitive to Chinese growth while the Canadian economy is more levered to American growth. The AUDCAD cross rate has staged a bullish reversal that is similar to the pattern seen in the oil price. I wrote before (see Good News: China soft landing, Bad News... and China beyond that hard/soft landing debate) that while the authorities recognized that they needed to re-balance China's growth from infrastructure-based growth to growth based on the consumer, such a move would directly hurt the wealth of party cadres and insiders, who stood to benefit from the profitability of State Owned Enterprises (SOEs). This may be an edict that the leadership leads, but the bureaucracy doesn't go along. Today, economic data shows that China's growth is slowing. The "correct" response is to continue the path to re-balance growth toward China's household, or consumer. The actual policy response has been more of the same - stimulus via infrastructure growth. News that the Chinese city of Changsha, in the central Hunan province, plans to spend Rmb829m, or 150 per cent of its GDP, made waves last month. It’s a fairly small city and one that was reportedly booming just weeks earlier. We recently made the point that slowing growth was leading the central government to back away from its tentative plans to rebalance the economy, and instead doubling down on imbalances with its push to keep GDP growing through investment, particularly in infrastructure. If China wants to maintain high growth to eternity, it is possible theoretically even though it is not very realistic, because it requires the government to do things that have been done before, and have been widely regarded as wrong. Because the government controls the issuance of the currency, there should theoretically be no budgetary constraint. So the government can spend and invest very heavily into eternity either directly or via state-owned enterprises even though there is nothing that China really needs but have not already had. In other words, investment will be done regardless of the expected return. To fund that, the government (including state-owned companies for the purpose of argument) borrow either from state-owned banks (while force banks to lend) or from the bond market (for the purpose of the current discussion, let us just say that both ways of financing are more or less the same). Money supply has to grow at some crazy numbers, and M2 will probably double every 2 or 3 years, and Chinese Yuan will depreciate substantially (there is a running joke among China sceptics that Bernanke is only an amateur when it comes to money printing. After all, Chinese invented paper, printing, and paper money). But because this implies ever more over-capacity in the economy, inflation could be surprisingly low. At the end, GDP will grow by 8% in Chinese Yuan term, and nothing disastrous would seem to have happened to majority of Chinese people (or maybe not). [I]nvesting in huge amount of money into something with very low return is destroying wealth. Let us say that a state-owned real estate developer invested a huge amount of money into a large-scale residential development. Despite being sold out, most of these flats were not occupied nor let out. These assets are generating no return, thus they are next to worthless. The real estate developer was lucky to have sold them all, but those buyers would have bought something with huge amount of money which turned out to be worthless. This is by no means the only scenario. The real estate developer in question could very well be unable to sell, and being drowned in debt. To speak more formally, if a country is directing resources into investing something that cannot generate return in excess of the cost of funding, the country as a whole will be destroying economic value even though the country is generating GDP. Because of overcapacity, the private corporate sector will probably not invest and have very low level of profit (if not close to zero as a whole), leaving the state-owned sector and local governments the only agents that will borrow and invest. The process of directing state-owned corporate sector to borrow and invest will generate output or GDP, but they will create even more capacity, leading to ever diminishing return. At the end, corporate profit (state-owned and private sectors combined) will fall to zero, if not negative. Ahead of changing of the guard in China, the authorities appear to have embarked on a policy of growth at any price, i.e. profit-less growth. So what we have is a case of crouching tiger (growth), but hidden profit (margin squeeze for corporates). The markets appear to understand that. That's why commodity related indicators, which benefit from infrastructure growth, are either consolidating or staging bullish reversals. On the other hand, Chinese corporates as reflected by the Shanghai Composite Index are falling, because their margins are getting squeezed. This situation is obviously not sustainable long-term. I do worry about what might happen to China in the next down leg of the global economy. What happens between now and then is anyone's guess. The most likely scenario is that US stocks will follow the election cycle and continue to grind upward, though in a highly choppy fashion. While I still believe that equities will continue to grind upward, stocks appear to be a little extended in the short-run. My inner trader tells me to pull in my horns, raise a little cash and wait for a better entry level. This is strictly a tactical trading call with a time horizon of a week or so. The chart of the SPX shows that the market has been exhibiting the bullish pattern of higher highs and high lows since early June. In the short-run, however, the market is now testing secondary resistance (dotted line) and faces further resistance at about 1% higher from current levels. My short-term overbought/oversold indicator of the risk-on/risk-off trade shows the risk-on trade in overbought territory. While an overbought market can get more overbought and there is further potential upside of 1% in the broader averages, the risk/reward ratio at this point is not tilted favorably for the bulls. I would rather wait for a better entry point if I had fresh cash and an aggressive trader may even wish to either lighten up positions or even possible go short in anticipation of lower prices in the near future. Remember - this is a trading call only. Know your risk tolerances and adjust your positions accordingly. What to do for the rest of 2012? What should we make of this volatile stock market? Just as it seems that the market starts to move in one direction, it reverses course and violently punishes the traders to try to catch the breakouts or breakdowns. I present my base case scenario below, otherwise known as my wild-eyed guess for the remainder of 2012. Bear case: Market internals scream "cyclical slowdown"
A review of the relative performance of the US equity sectors scream "cyclical slowdown". Consider this relative performance chart of the Morgan Stanley Cyclical Index (CYC) against the market. Cyclical stocks have been in a relative downtrend since February. The message of the market from relative underperformance of the cyclical sector says "cyclical downturn". The relative performance of Consumer Discretionary stocks also tell the same story. This sector had been the leaders for quite some time, but this sector is now rolling over on a relative basis, which is not a good sign for the risk-on, high beta trade. Technology, which I characterize as a growth-cyclical sector, is not providing any leadership either. The relative performance of the equal-weighted NASDAQ 100, which takes out the effects of heavyweight and market darlings such as Apple, has been rolling over on a relative basis. Bull case: Sentiment models screaming "buy"
While the cyclical indicators appear to be pointing south, long-term sentiment models are screaming "buy". 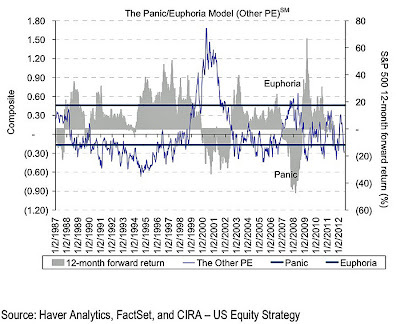 The Citi Panic-Euphoria Indicator (via BusinessInsider) has flashed a buy signal. Similarly, the BoAML Sell-Side Indicator, which measures the average recommended equity exposure of Street strategists, is showing an off-the-charts bearish reading that is contrarian bullish. 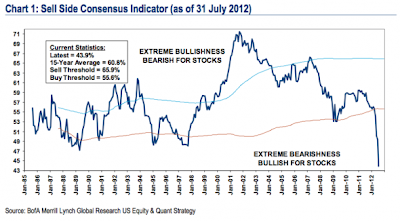 How can we reconcile the apparently bearish macro outlook with a bullish sentiment outlook? If we were to only look at the relative performance of US sectors, the story would look dire. However, an analysis of globally cyclically sensitive indicators don't tell the same story of a cyclical downturn. The chart of Dr. Copper, for example, is showing signs of stabilization. The price of the red metal stopped going down in June and has started to consolidate sideways - indicating that the one big consumer of commodities, i.e. China, may be starting to bottom. Similarly, the AUDCAD exchange rate has been rallying. Both the Australian and Canadian economies are similar in their commodity exposure. The only difference is Australia is more sensitive to Chinese demand while Canada is more sensitive to American demand. The rally in the AUDCAD rate is an indication that the growth expectations are turning around on the Chinese economy compared American one. Another indication that the global cycle is not tanking is the relative performance of the cyclically sensitive South Korean market, or economy. The chart below of the relative performance of the Korean ETF against the MSCI All-Country World Index ETF (ACWI) shows Korea to be range bound on a relative basis. The relative performance of Korea against ACWI stands in marked contrast to the relative performance of the CYC against the SPX shown above. So far, we have discussed the US and Asia (mostly China) in considering the market outlook. What about Europe? The key to this latest plan remain the Germans. Will the German elite, the Bundesbank and German public acquiesce? My best guess is that they won't blink until German society starts to feel serious pain and fear. Fear will come in the form of a possible collapse of their beloved Landesbank and financial system, which is starting to show strains (see here). The one canary in the German coalmine that I am watching is the share price of Commerzbank, which is one German bank that is known to be close to edge of the precipice. Should CBK collapse, watch for the Germans to blink. A volatile grind upward for the rest of 2012? In conclusion, an investor who just focuses on the US market may be inclined to turn bearish. My take is that the leadership will start to shift away from US equities to stocks more exposed to the global cycle. The most likely scenario is that US stocks will follow the election cycle and continue to grind upward, though in a highly choppy fashion. Key macro risks loom large. That's why the markets will be very volatile and frustrating for investors and traders alike. Take positions, but don't forget to maintain risk controls. What did you really expect from the ECB? I am sure you've had the same experience I've had with hand dryers in the bathrooms of some restaurants. While some chains, such as Costco, use the more modern ones, such as the Dysan, are high speed and efficient, the older ones take forever to dry your hands and don't work very well. After waiting what seems to be an eternity, you just wind up wiping your hands on your pants. [E]xperts at the central banks of the euro zone's 17 member states had no idea what to do with the news. Draghi's remark was not the result of any resolutions, and even members of the ECB Governing Council admitted that they had heard nothing of such plans until then. When the ECB announced yesterday that it "may undertake outright open market operations of a size adequate to reach its objective", it shouldn't have been a surprise. Même s'il faudra encore quelques jours, voire quelques semaines, pour finaliser le dispositif en question, la BCE préparerait une opération concertée avec les Etats susceptible de limiter l'envolée des taux d'intérêt de l'Espagne, mais aussi de l'Italie. While it gave lip service to the discussion of "policy options" to address the "high risk premia" observed in Spanish and Italian debt costs, the ECB was holding the politicians feet to the fire to enact policy reforms, i.e. fiscal consolidation, structural reform and European institution building. Translation: we'll play ball as long as you proceed with greater economic integration and the kinds of structural reforms outlined in Draghi's Grand Plan that he outlined earlier this year. The ECB statement continued with praise for "fiscal consolidation" (read: austerity), but went on to say that "structural reforms" are also essential. Draghi's term for "structural reform" is another way of saying "growth pact" for him, which really amounts to a form of internal devaluation between the North and South. While significant progress has been achieved with fiscal consolidation over recent years, further decisive and urgent steps need to be taken to improve competitiveness. From 2009 to 2011, euro area countries, on average, reduced the deficit-to-GDP ratio by 2.3 percentage points, and the primary deficit improved by about 2½ percentage points. Fiscal adjustment in the euro area is continuing in 2012, and it is indeed crucial that efforts are maintained to restore sound fiscal positions. At the same time, structural reforms are as essential as fiscal consolidation efforts and the measures to repair the financial sector. Some progress has also been made in this area. For example, unit labour costs and current account developments have started to undergo a correction process in most of the countries strongly affected by the crisis. However, further reform measures need to be implemented swiftly and decisively. Product market reforms to foster competitiveness and the creation of efficient and flexible labour markets are preconditions for the unwinding of existing imbalances and the achievement of robust, sustainable growth. It is now crucial that Member States implement their country-specific recommendations with determination. Bottom line: The ECB is prepared to give the politicians cover to rescue the euro, but there is a quid pro quo involved. Don't expect immediate action, but this will be the normal back-and-forth of a negotiation process that will drive the markets crazy.